Perfect binding is the standard book binding format for softback books (AKA paperback or softcover books). Perfect binding involves gluing the pages into the cover, before trimming to give a ‘perfect’ finish and a square-backed spine. A cost-effective option. PUR binding gives the same softback look as perfect binding but is much stronger. 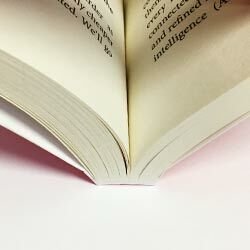 PUR glue is also more flexible, meaning books can open wider, and is longer-lasting. 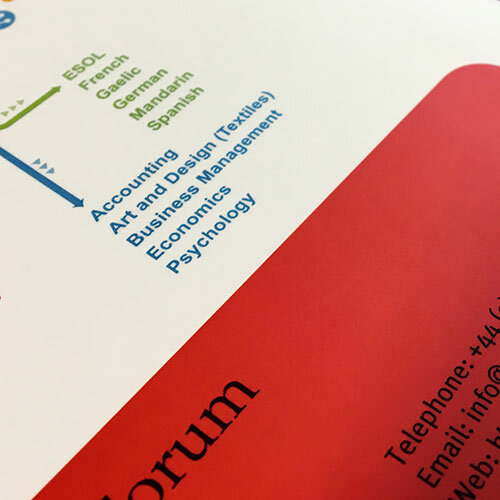 PUR is best suited to books with heavyweight papers or a large number of pages. Also known as spiral, coil, or ring binding. This method uses coated metal wires to bind documents together. It’s useful where your book needs to lie flat or fold back on itself. The cover can be a card or thicker board. 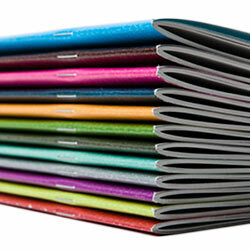 Sewn binding is a traditional book binding method, which is still popular. Pages are collected into sections, and sewn together. Sewn binding is strong and can be used for both softback and hardback books. 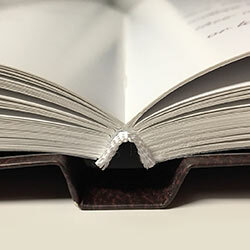 Saddle stitching involves sheets that are folded to make a booklet, which is bound with two ‘staples’ down the spine. It’s what’s used for most magazines and brochures, where the spine is not square. It’s a lower cost binding option. Flexi binding / Ota binding offers a mix of the best features of case bound and softback binding methods. Incorporating a softcover, and a flexible spine, the finished book opens flatter (better ‘lay flat’ properties) than other types of softback book. Endpapers can be added. This is one of our preferred binding methods. 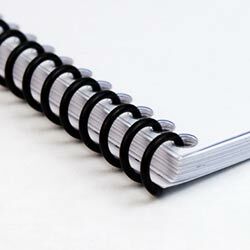 We also offer alternative book binding methods such as; notch binding, lay flat binding, swiss binding, and more. Contact us for more info. Inner pages of books are usually printed on one of two broad types of paper; coated and uncoated. Comes in matte, silk and gloss finishes. 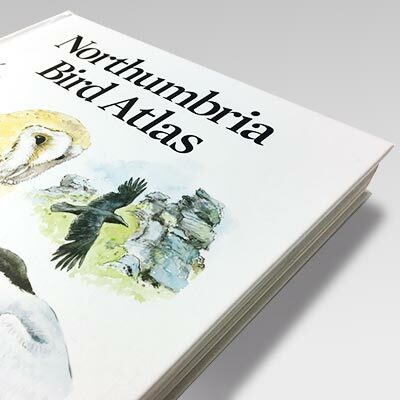 Great for illustrated and graphical books. Popular weights: 115 gsm, 130gsm and 150gsm. Popular choice: Bookwove, white or cream. Popular weights: 70 gsm and 80 gsm. Other paper types are available so, if you’re unsure, please ask. We recommend one-sided board for a quality softback cover. This is the most popular choice for softback book cover material. As the name suggests, one-sided board can only be printed on one side (i.e. the outer cover only). One-sided board gives your book a stiffer, more substantial cover, compared to silk. Which means your book’s cover is less likely to warp and bend over time, and it just ‘feels’ better. 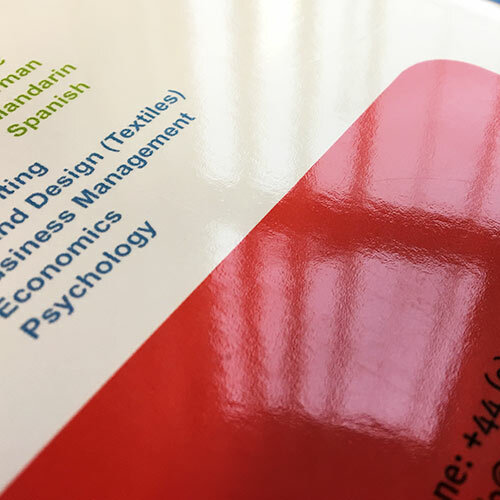 If your softback book’s cover needs to be printed on the inner covers, then silk is a material to consider. Despite the increased weight, silk results in a more flimsy cover compared to one-sided board, because both sides of the paper are coated. Hence, unless you want to print on your inner covers, it’s not our preferred choice. Below are the three most popular methods used when making a case bound book’s cover. A printed paper case (PPC) is a printed and laminated sheet which is wrapped and glued onto a case bound book’s hard case. Can be used with or without a dust jacket. If a dust jacket is used in conjunction with a printed paper case, often both will use the same design. Many books only need a printed paper case. Cloth was traditionally used to cover the case of a case bound book. Cloth covers are often given a foil blocking on the spine and front cover. Can be used with or without a dust jacket. Genuine cloth can be expensive, but imitation cloth provides an excellent alternative at more reasonable prices. A dust jacket is an optional, printed sheet that is often used to wrap around a case bound book. The dust jacket covers the case, without attaching to it. Flaps fold under the inner covers. 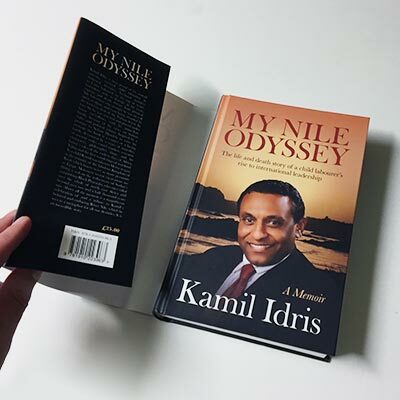 Dust jackets can optionally be finished with foil blocking, embossing, and UV varnish. Endpapers are used in case bound books, to join the book block (pages) to the case. The endpaper is a long sheet, half of which is glued into the inner cover, and the other half is glued along a thin strip of the first/last page of the book, leaving the rest to be loose (almost like a page of the book). Case-bound books have two endpapers – one at the front and another at the back. 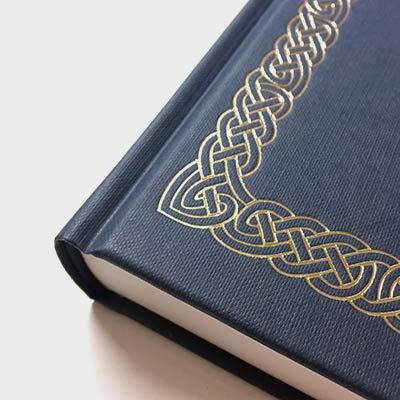 Endpapers can also be used on some softback books, eg flexi-bound books, to give a thicker cover and premium finish. All softcovers, printed paper cases and dust jackets that we print are given a lamination, for greater durability. Choose from matt or gloss lamination. If in doubt, choose matt! Matt lamination gives a quality, smooth, low-sheen finish. Matt is usually our recommendation. Gloss lamination is a high sheen surface that protects and enhances your book’s cover. Cover flaps – an extra folded part of a softback cover, for adidtional info and extra cover thickness. 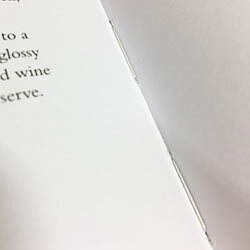 Embossing and debossing – the raised or indented parts of the cover, for extra emphasis. UV varnish – Add selective shiny areas to the cover. Also known as ‘spot varnish’. 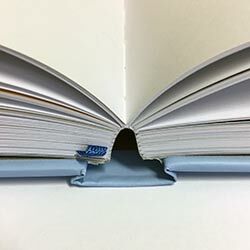 Head and tail bands – a band of fabric at the top and bottom of a case bound book’s spine. 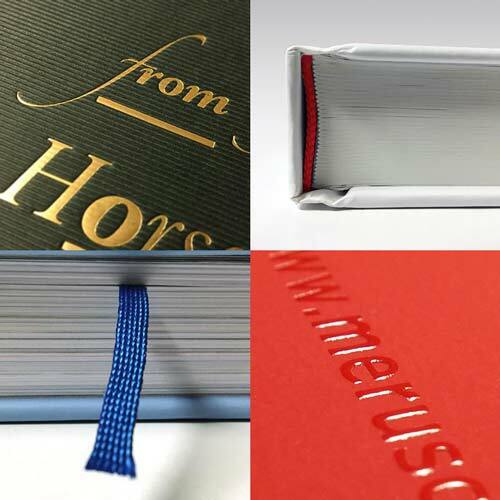 Ribbon markers – add a ribbon, often found on cookery books and reference books. Gilt edging – ink is applied to the edge of each page. Ready to order your book, or looking for a price? Or would you prefer to talk? Contact us.